Bridgeport, Connecticut is a city of peninsulas, divided by creeks, rivers, and low-lying wetland areas. 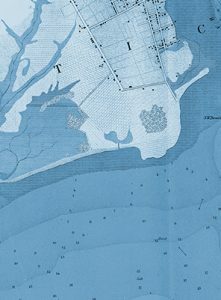 It is a port city at the juncture of the Pequonnock River and Long Island Sound, and 19th and early 20th century industrialization fueled its growth as it became the most populous city in Connecticut. For centuries, Bridgeport’s connection to flowing water has shaped its development, industry, and culture. 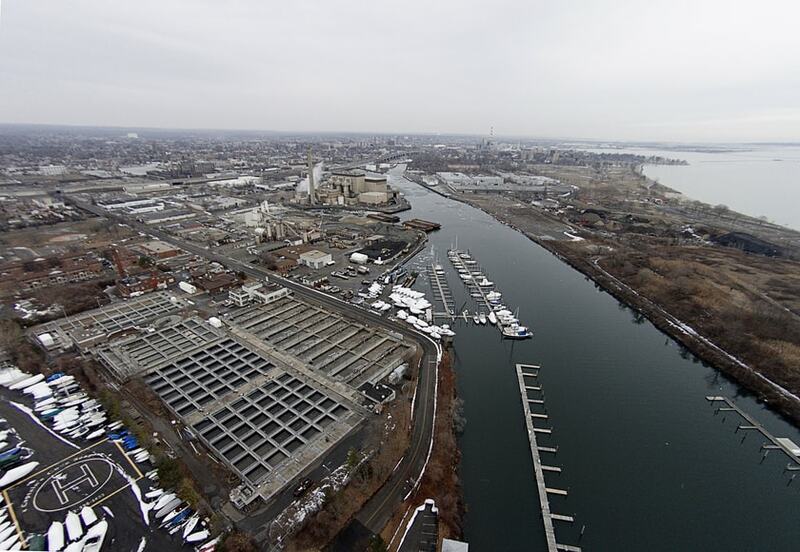 Today, Bridgeport faces significant environmental challenges that require it to redefine the relationship between the city and the water that surrounds and flows through it. Through “living with water,” the city can also create a new economic reality, fostering revitalization in its neighborhoods and driving prosperity for its residents. 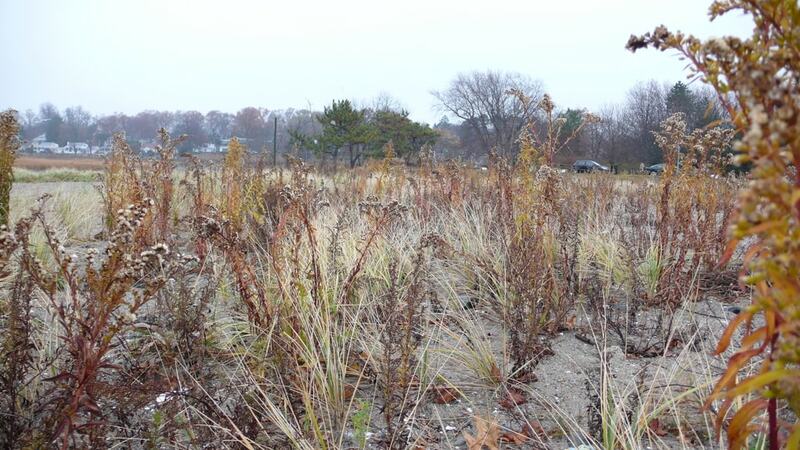 Landscape Types: Bridgeport consists of upland peninsulas, divided by creeks, rivers, and low-lying wetland areas. 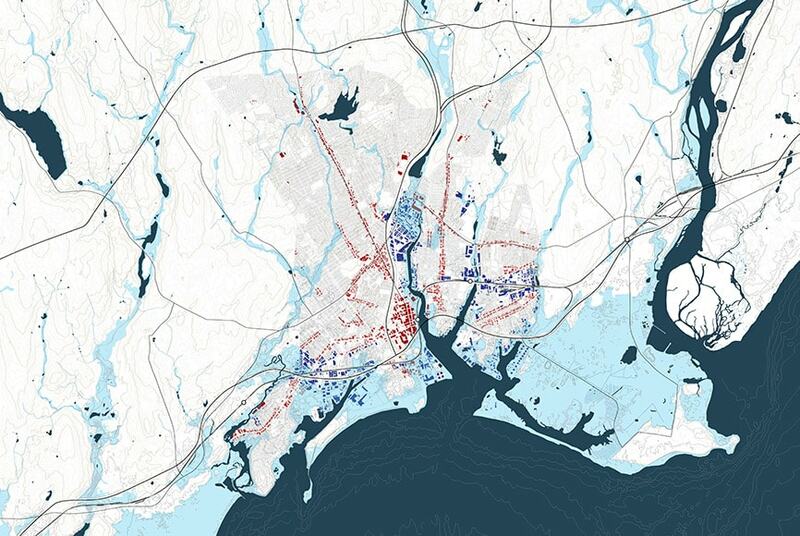 Regional Flows Map: Bridgeport’s urban form and geography are representative in many ways of other urban communities along the Connecticut coastline that also have old harbors, weakened or abandoned industries, and critical facilities serving regional customers. Urban Corridors Map: Bridgeport’s earliest commercial corridors developed along ridge lines running north to and from the coast and along east-west corridors that connected coastal cities. 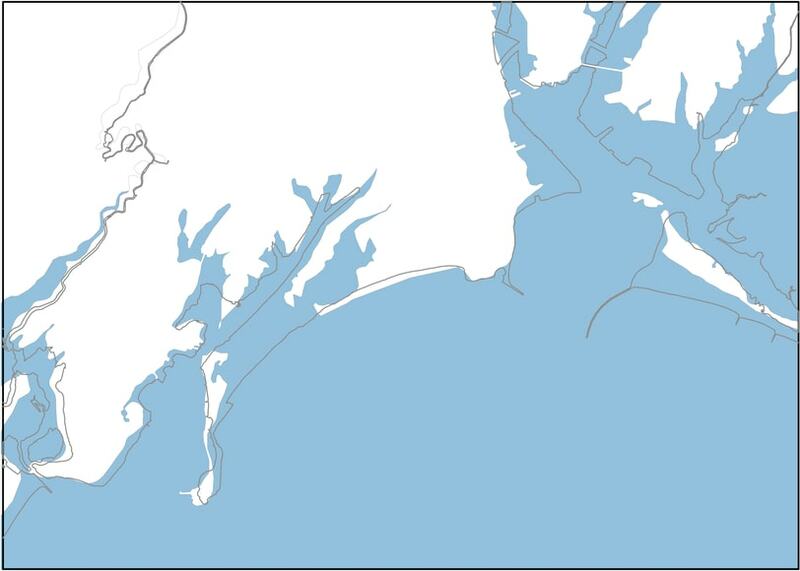 Industrial areas developed along waterfront edged to access shipping channels. 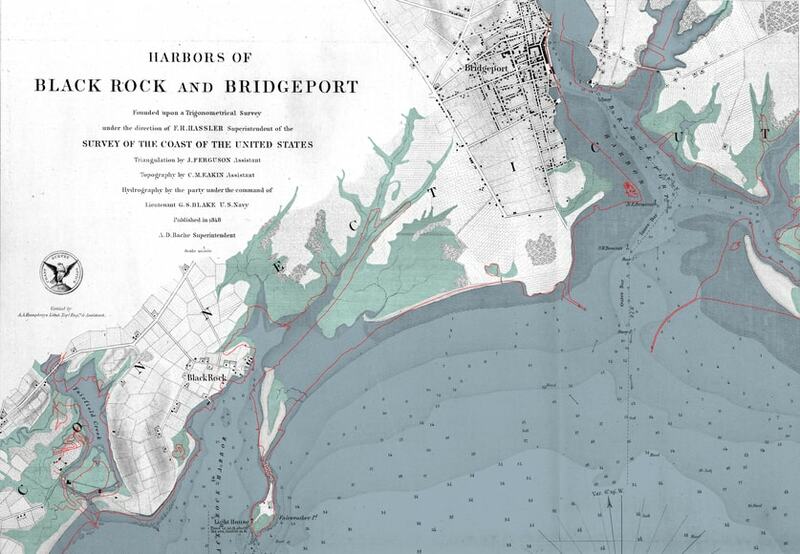 Dynamic Landscape map: The coastline of Bridgeport has experienced continuous modification since that area was first inhabited and urbanized. Coastline timeline: In addition to natural forces such as longshore drift, economic pressures on real estate from industrial and commercial interests have resulted in a process of landfilling, both along the edges of the city and within former shallow marsh areas. 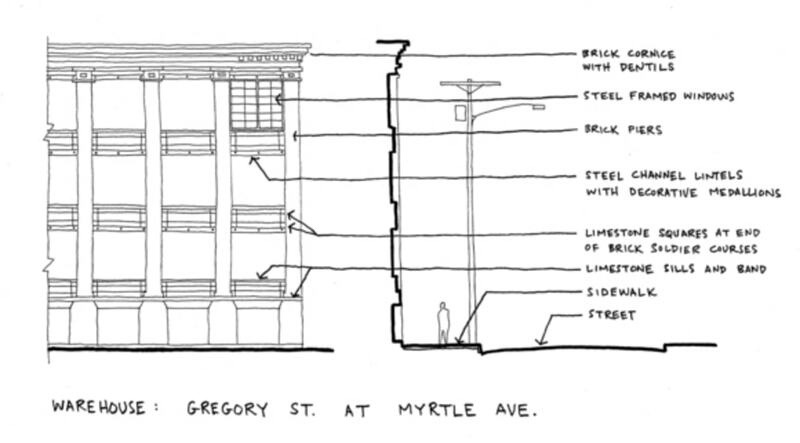 Building Elevations + Sections :Buildings throughout the study area can be read as a historical record of the development of Bridgeport across eras. Bridgeport is a place of exchange. Stormwater flows from upland areas, bringing with it sediments, nutrients, and pollution. 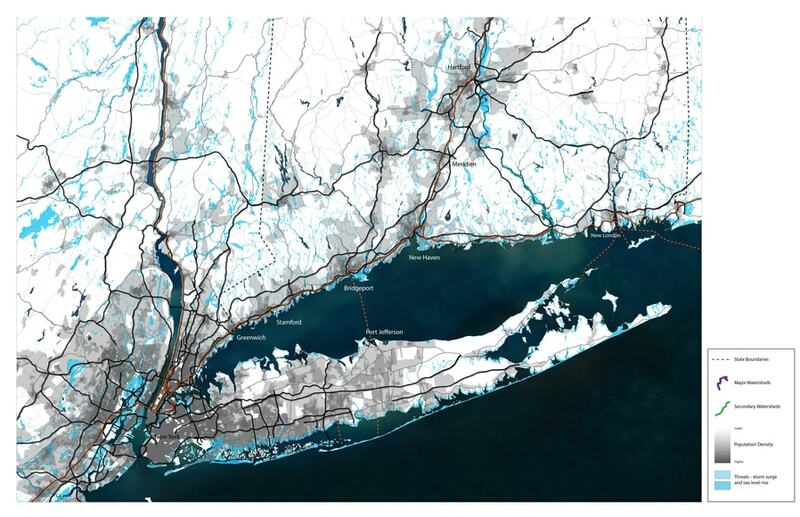 Tides push in and out of coastal marshes and between the city’s peninsulas, and storm surge periodically lifts Long Island Sound up and over coastal areas. Coastal hydrology sweeps sediment and other materials along the coast, constantly reshaping the water’s edge. The city’s coastal ecology and economy exist because of the exchanges that are only possible at the juncture of land and water. 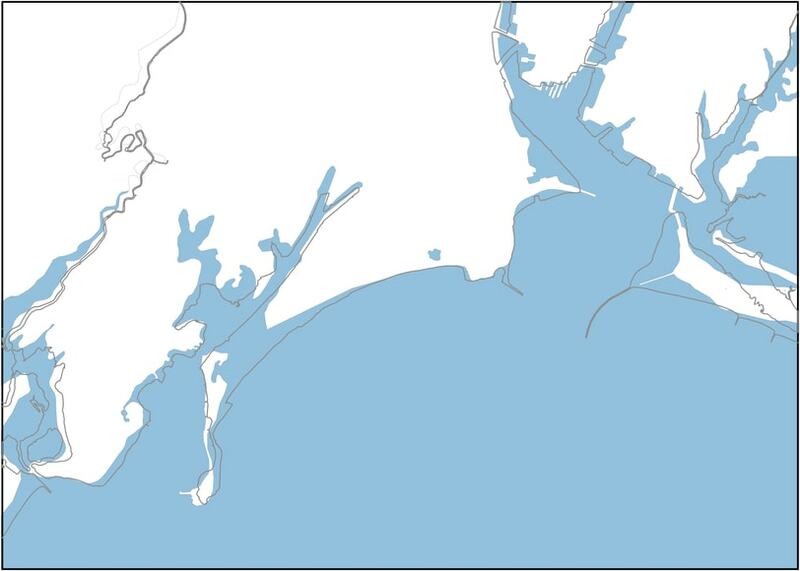 Some of the technological advances and land use practices of the past have compromised the ability of the city to adapt its coastline and the relationship between land and water. The city’s edge has been recently static, when fluidity will move the city forward. The industries that made use of the water by hardening the city’s coastline and riverbanks left Bridgeport as it did so many other places. 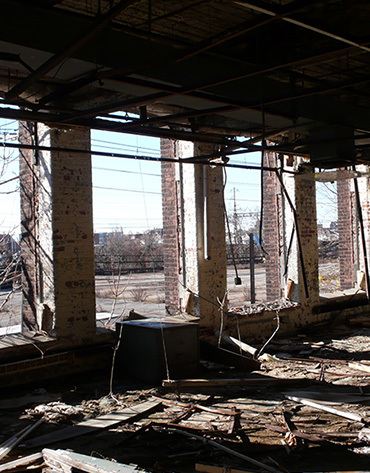 What remains are the challenges of brownfields, high rates of unemployment, and diminished municipal revenues. Its downtown core and many of its neighborhoods have been hampered and compromised due to the loss of manufacturing jobs. Old factory buildings, mill buildings, and worker housing speak to a proud industrial past, though much of that cultural heritage is lost or at risk due to vacancy and disinvestment. Due to its proximity to New York and its location along the Northeast Corridor, Bridgeport is well connected by transportation infrastructure and utilities to regional markets and centers. It is a place of great cultural diversity, and is rich in history and with amenities like the Olmsted-designed Seaside Park. Because of these factors, Bridgeport is well poised to capture growth in Connecticut, as baby boomers age out of suburban settings and younger demographics seek out the amenities and cultural activities of urban areas as well as the relative affordability of the city’s housing stock. 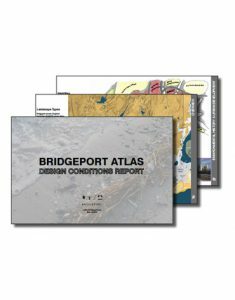 To learn more about Bridgeport, download the Resilient Bridgeport Atlas. 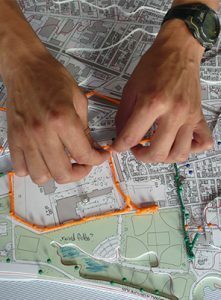 The document captures a detailed geographic understanding of the city, developed through research, drawing, and analysis of the city’s geography, environmental history and development, water and climate conditions, and ecology. 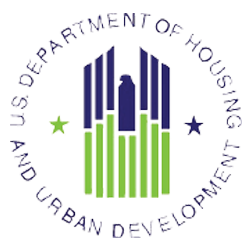 Flooding – as a result of both storm surge and rainfall – damages property and disrupts daily life and business, particularly in coastal and low-lying areas like the neighborhoods ringing Black Rock Harbor and Cedar Creek. The flooding and its growing impact are a result of development encroaching upon wetlands and waterways, high rates of runoff from paved surfaces, and rising sea levels. 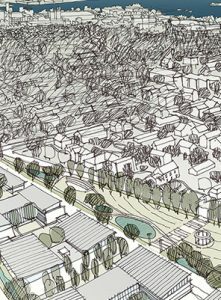 The combination of decades-long economic disinvestment, a shrunken municipal tax base, polluted soils, poor public perception, and present-day floodplain regulations pose myriad challenges to redevelopment and revitalization efforts in disadvantaged neighborhoods such as the South End. Decades of filling in wetlands, hardening coastlines, and other modifications have created the boundaries of the city that we know today, but have also compromised the city’s natural beauty and diverse coastal habitats. Heavy industry has left behind dozens of brownfield sites, while rising sea levels and saltwater intrusion threaten the city’s historic parks and landmarks. 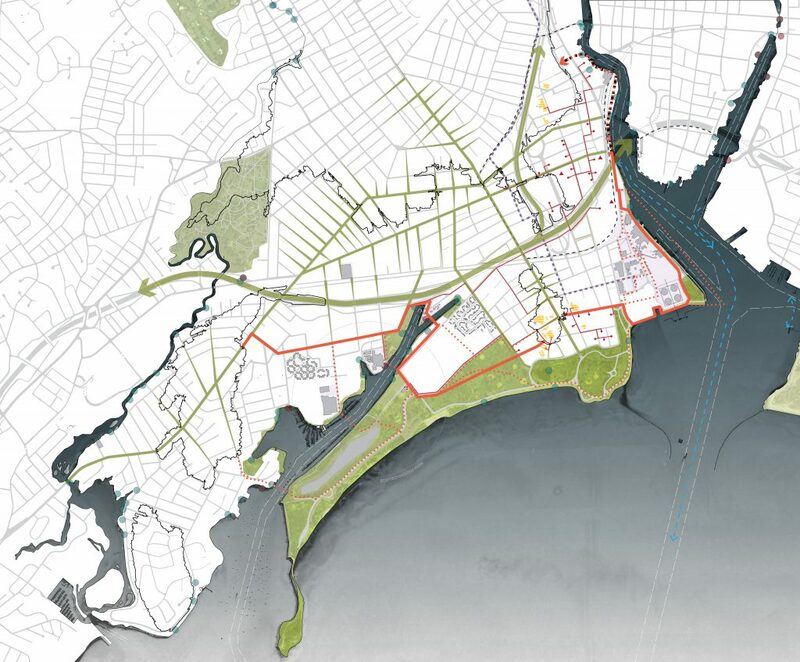 Bridgeport can lead the way for New England in showing how a coastal community with limited resources can adapt urban systems, policy, and planning approaches to protect, enhance, and connect. The adaptations will be incremental and targeted, but will demonstrate what it means to “live with water” and to thrive at the water’s edge in the 21st century. Investments in infrastructure and public spaces that strengthen and protect the community will support both public and private investments. These investments will rely on collaborations between, public, private, and institutional partners, working together to create new affordable housing, build businesses and job opportunities, enhance public spaces, and celebrate Bridgeport’s many peoples and cultures. Resilient Bridgeport brings together Bridgeport residents, civic leaders, and institutions to work together on pressing environmental challenges, and developing shared mindsets and approaches. This occurs through dialogue, collective learning, sharing educational and advocacy resources, and through collaborative efforts to advance new possibilities for adaptation and growth. 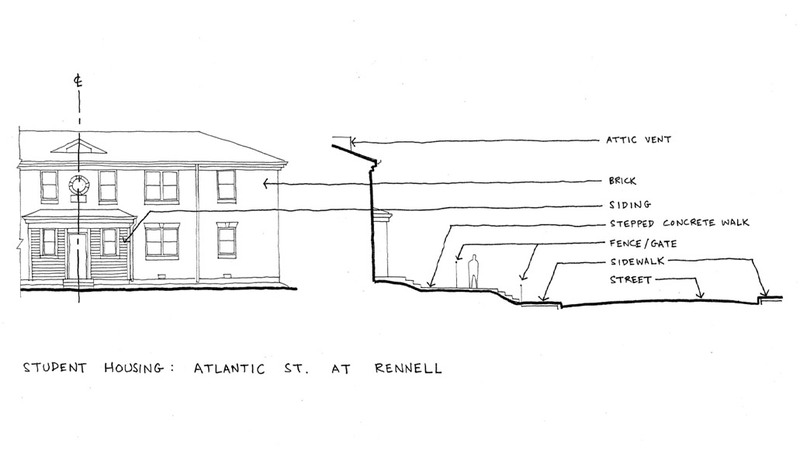 Resilient Bridgeport focuses on the South End and Black Rock Harbor, selected because of their vulnerability and unmet needs, historic character, and critical infrastructure. 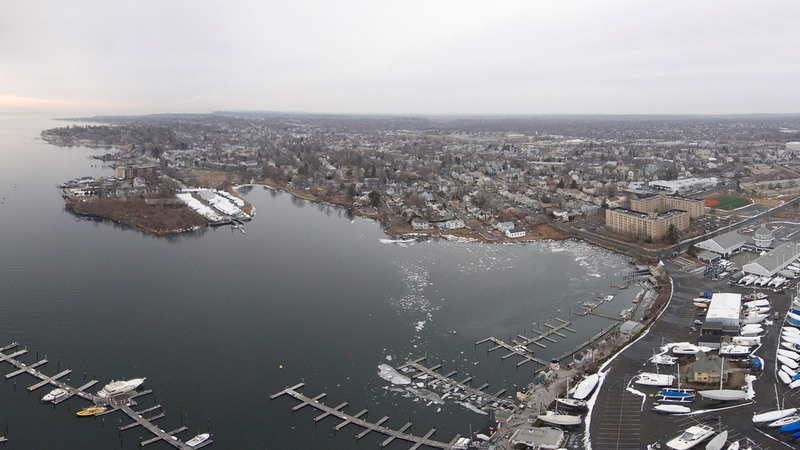 Sustained study of this one area will engender strategies and design principles that are relevant to Bridgeport’s other coastal areas (East Side and East End, in particular) as well as other coastal communities throughout New England and the Northeast. 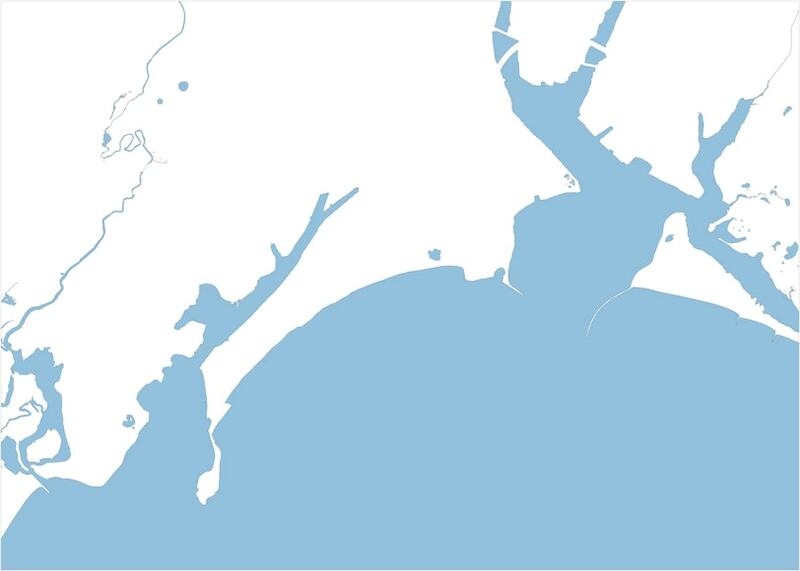 The study area is located on the Long Island Sound, bounded to the south by water and Seaside Park, to the east by Bridgeport Harbor, and to the north by Fairfield Avenue, State Street, and downtown. 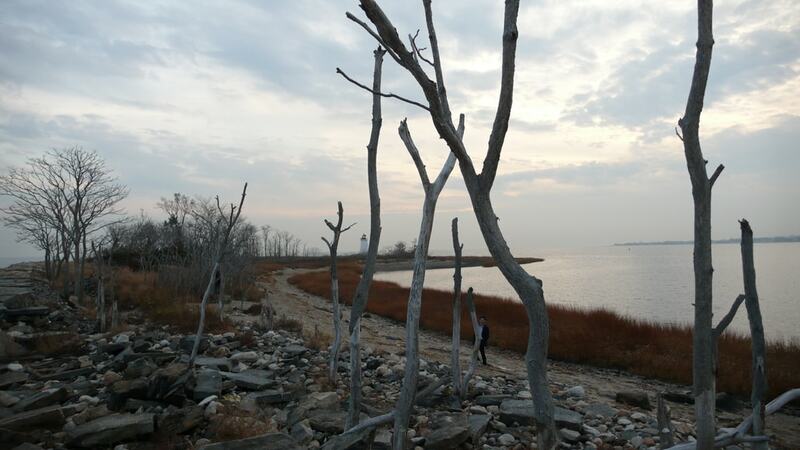 Bridgeport’s low-lying South End, Black Rock Harbor/Cedar Creek area host vibrant and diverse communities. 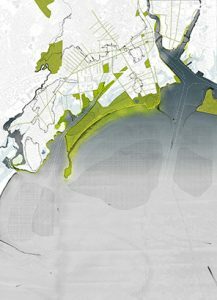 The South End is Bridgeport’s most vulnerable coastal area, with over 6,000 residents (2014 South End NRZ plan), including students and public housing residents, already adversely affected by regular storm events, blizzards, sea level rise, and hurricanes. 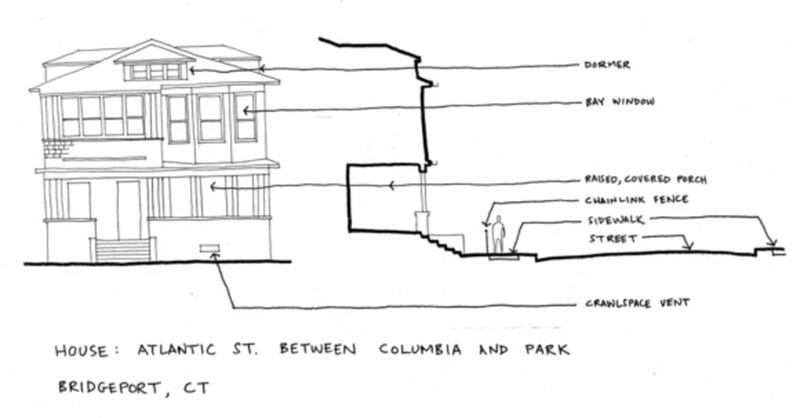 In the South End, industries and regional power generation abut historic homes, including grand mansions, small cottages, and cultural landmarks like the Freeman Houses. From the South End, one has both sweeping views of Long Island Sound across the Frederick Law Olmsted-designed Seaside Park and the iconic red and white striped smokestack of the PSEG Bridgeport Harbor Generating Station. The Black Rock Harbor/Cedar Creek area is an active hub for recreational boating as well as barges and the industries they serve. The land on either side of the creek, much of it formerly wetlands that have been filled in, are low and susceptible to flooding. These include the Eco-Technology Park, Sikorsky’s first factory site, and P.T. Barnum Apartments public housing.